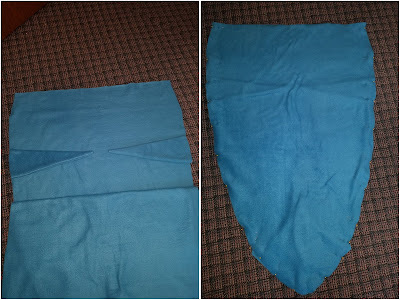 Fold the fabric in half the long way, fold in half again.. it is now folded into 4 layers. With the fold on the left, mark a straight line from the top right corner to the bottom left corner. 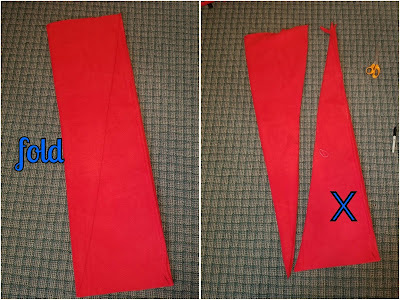 Cut and discard the X fabric, you will not need it. You now have a front and back piece of the tail blanket. 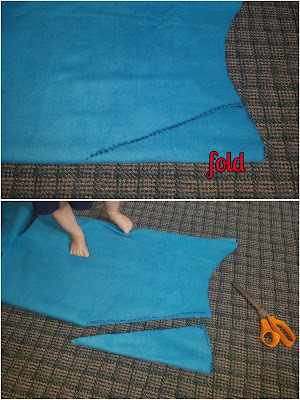 Fold the contrasting fabric in half, fold again, you now have 4 layers. Trace 3.5 triangles. You now have 13 triangle pieces, this will make 7 spines. 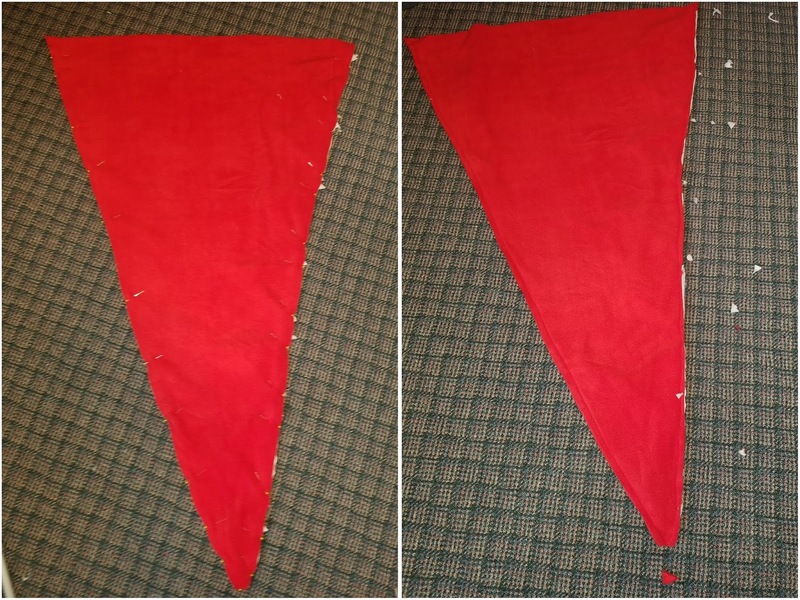 Cut out and sew each of the 6 triangles on 2 sides, fold one triangle in half and sew on one side (this is the tail end spine), leaving one side open on all triangles (red dashed line). 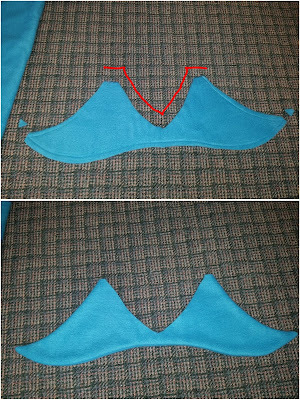 Trim the top corners to reduce bulk and turn the triangles right sides out. 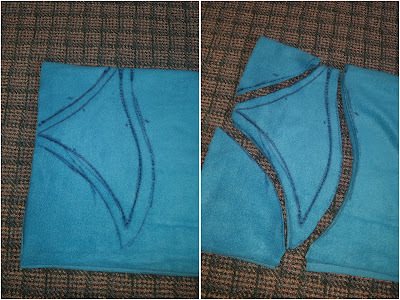 Line up the triangles between the two pieces of the main body, cut edges lined up with the side edge, the tops of the triangles pointing into the main body. 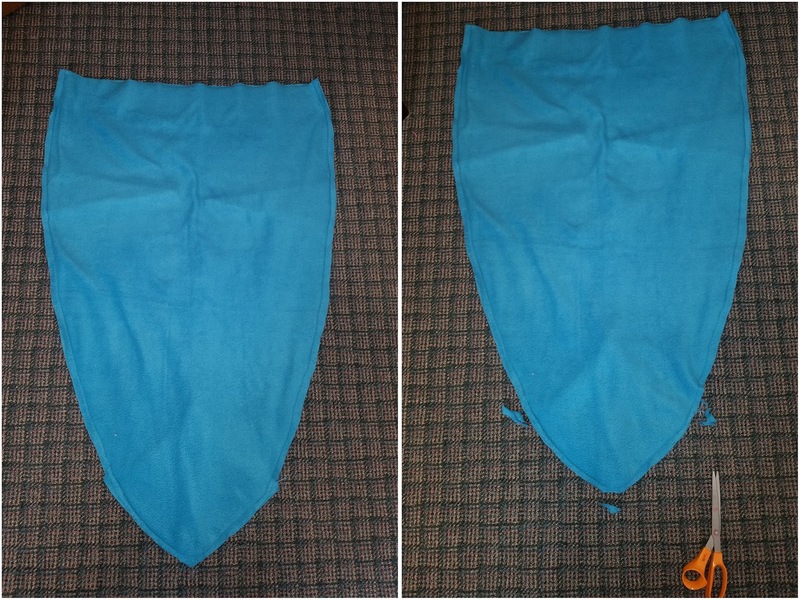 Pin and sew both sides of the tail blanket, leaving the top open. 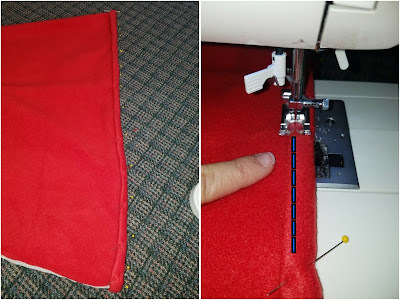 Trim the contrasting color and the point of the blanket to reduce bulk. Fold the top edge of the tail blanket under twice and stitch along the dashed blue line. 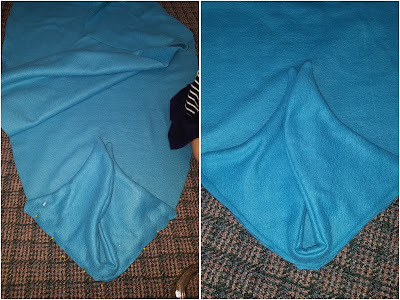 Turn right side out and you have a dragon tail blanket! 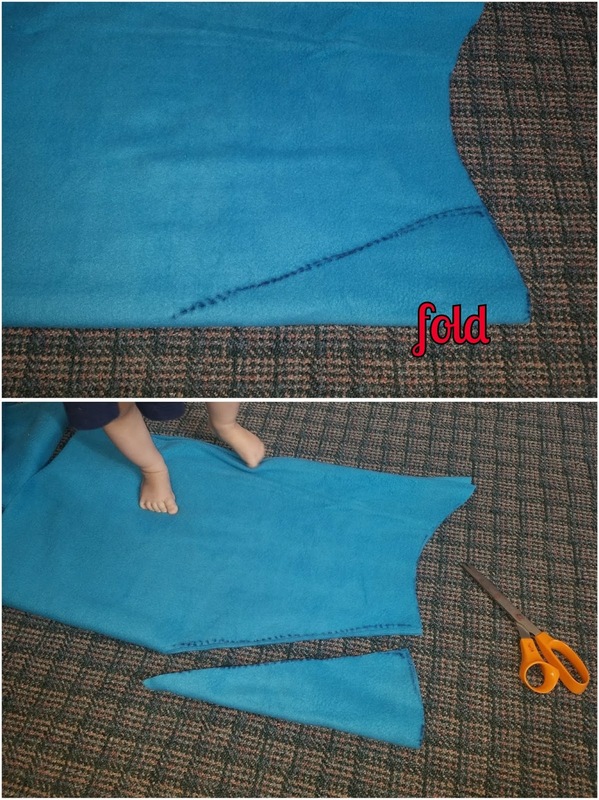 Fold the fabric in half the long way. Measure 40" from the top, mark the line, and cut. 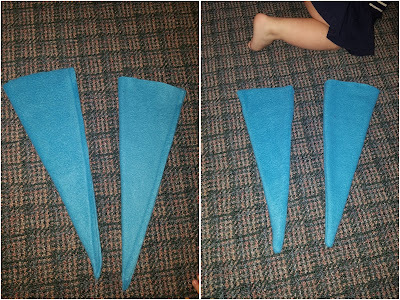 Set the bottom portion aside, you will use it for the tail and fins. 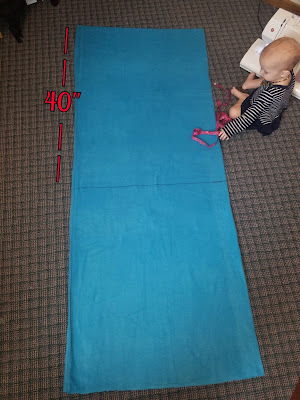 Double check toddlers measurements before cutting! 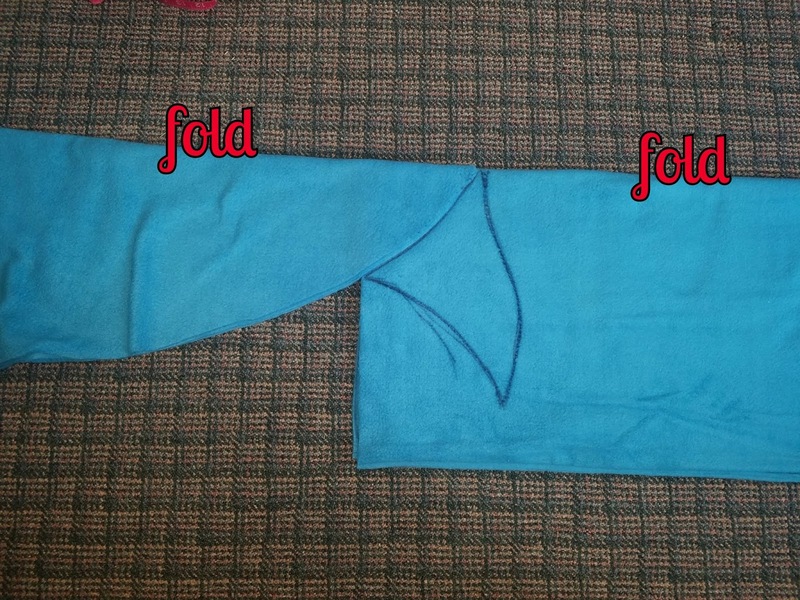 Fold in half the long way again, it is now folded into 4 layers. 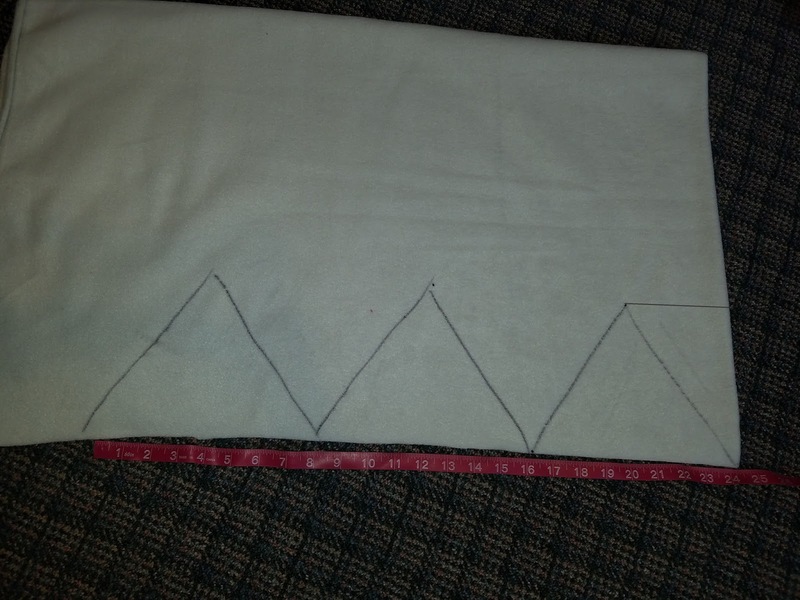 With the fold on the left, mark a curved line from the top right corner to the bottom left corner and cut. 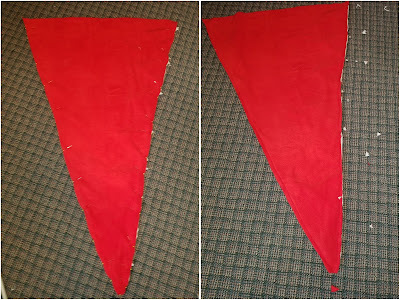 Discard the cut off piece on the right. 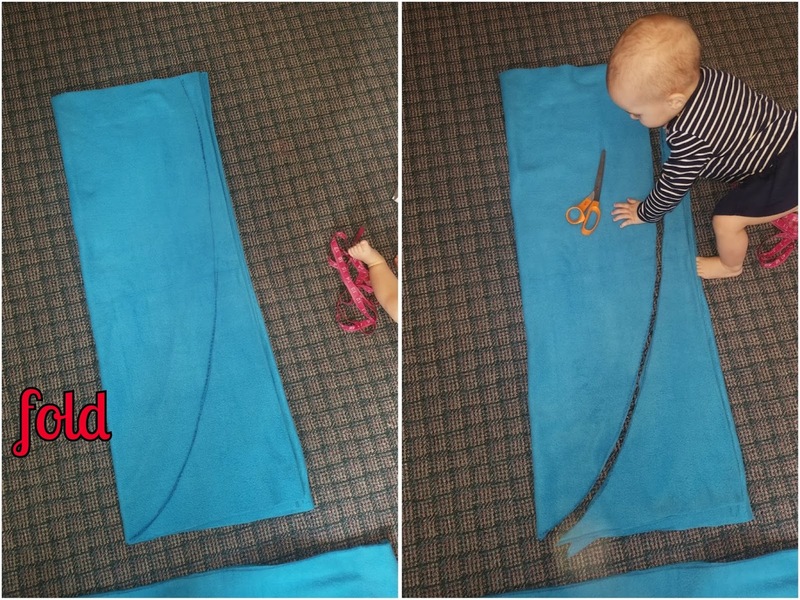 You now have a front and back piece of the tail blanket. This chickadee is pulling her weight around here.. 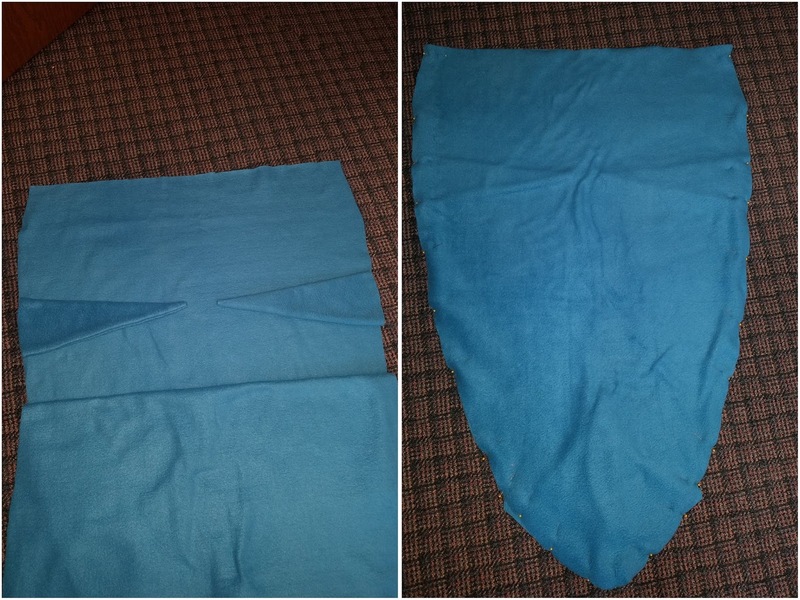 Fold the saved bottom piece, from the first step, in half the long way, it is now folded into 4 layers. 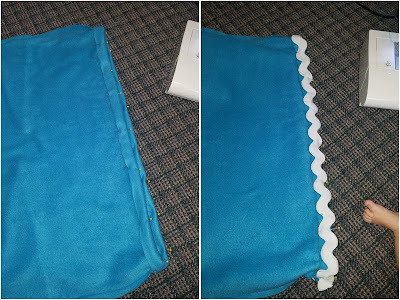 Line up with the tail blanket piece. Overlap the tail blanket with the fabric. 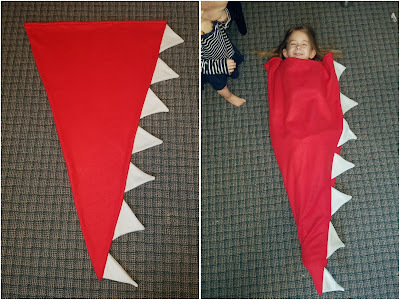 Trace a shark tail around the main tail blanket. This will be your sewing line. 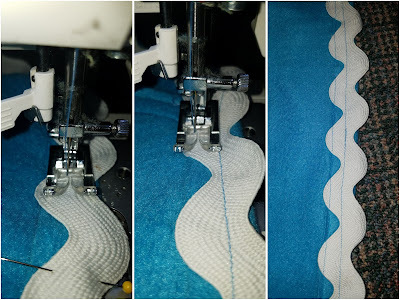 Add another line around the trace and cut. You now have the front and back piece of the shark's tail. Open the shark tail and stitch around, leaving the marked red sides open. 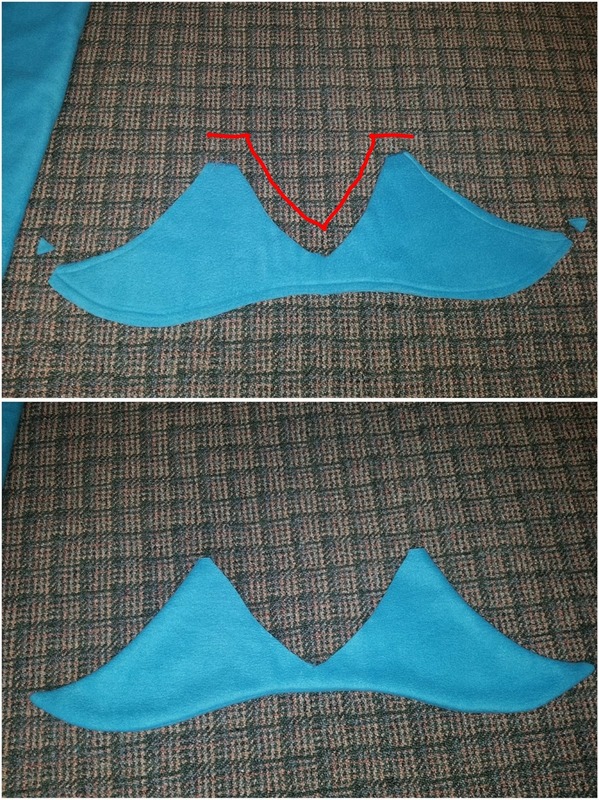 Trim corners to reduce bulk. Turn right side out. From the left over fabric, folded in half, trace and cut out long triangles for the fins. Notice where the fold is. You now have 2 trianlges. 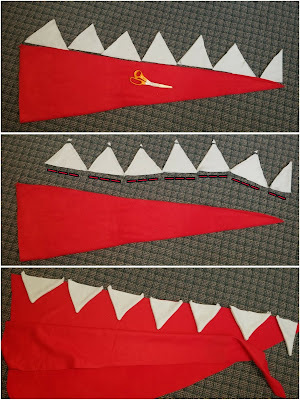 Fold each triangle in half and sew along one long side, turn right side out. Pin the shark tail to the bottom of one of the tail blanket, lining up the middle and edges, and sew. 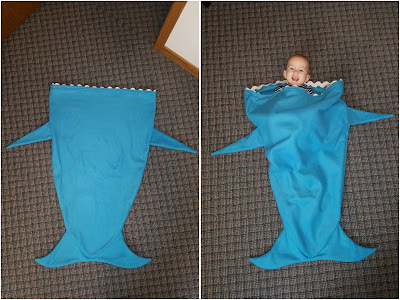 Place the fins, sewn side down, onto the same piece of tail blanket fabric. Layer the second piece on top and pin everything together. 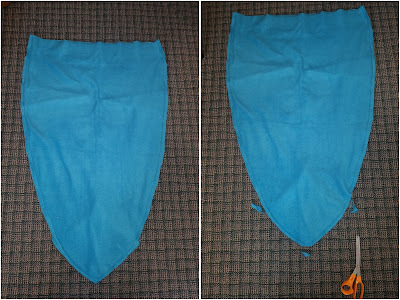 Sew the two sides of the tail blanket, leaving the top open. 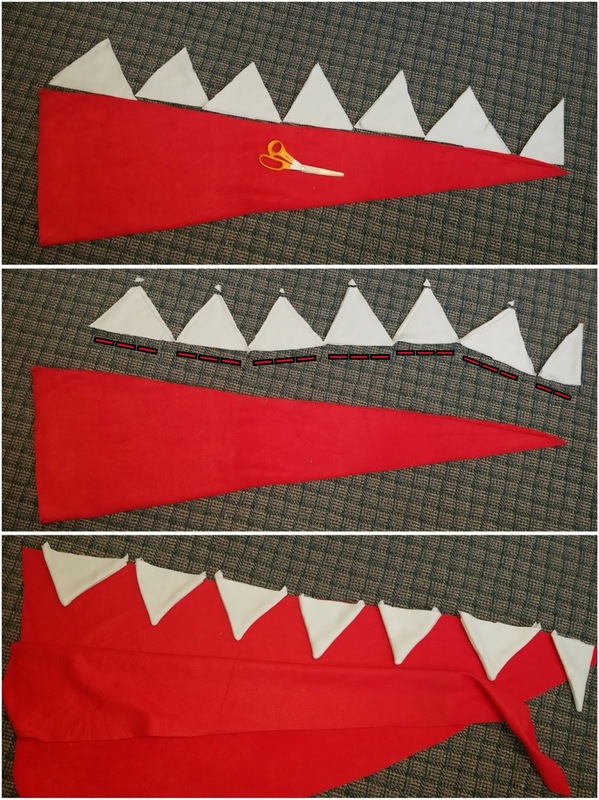 Trim shark tail and point to reduce bulk. Fold the top edge under about 1". Pin the rick rack on top. Sew 2 rows of stitches, one along the middle of the rick-rack and one along the inner edge as pictured. 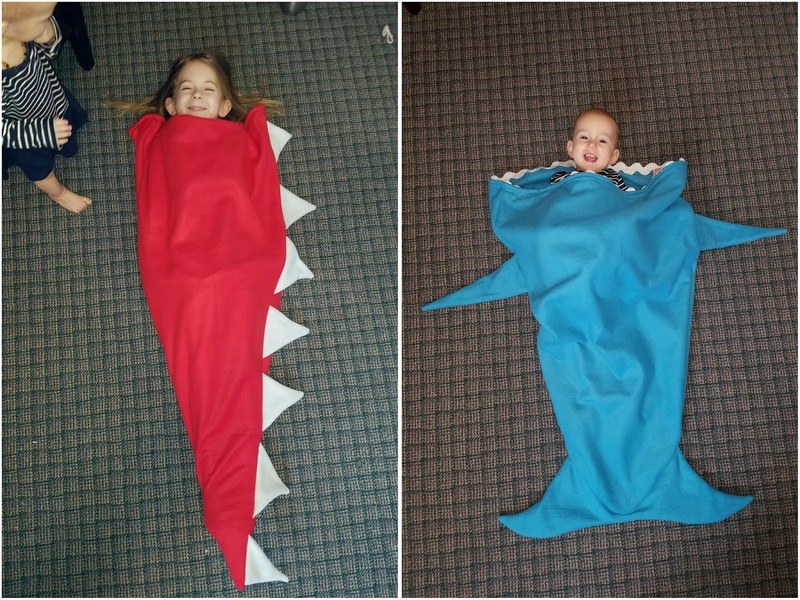 Turn right side out and you have a shark tail blanket! 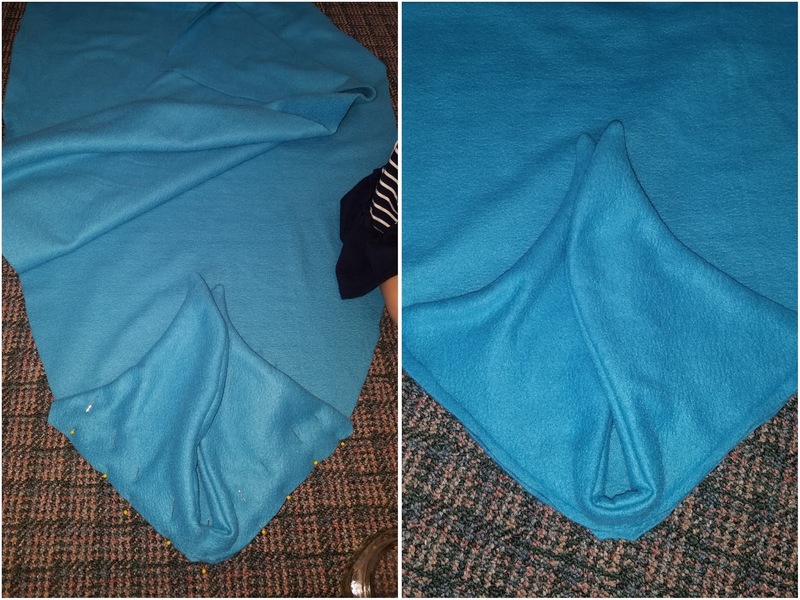 If you make these blankets, send me a photo. I would love to add it to this post!